In the north-eastern tip of Colombia, fierce resistance to Cerrejón, one of the world’d largest open-pit coal mines, has seen indigenous communities block highways and railway lines in recent weeks. These protests take place in the context of a wider movement of indigenous people trying to safeguard their territories. “In 30 years of pillaging natural resources, [the company] has achieved absolutely nothing positive for us,” says Yasmin Romero Epiayu, an indigenous Wayúu woman who resides near the Cerrejón mine in La Guajira, Colombia. Instead, Romero points to the threats to local wildlife, soil, vegetation and waterways that the mine poses for many indigenous communities in the region. The sheer scale of the mine is hard to imagine – Cerrejón produces 32 million tonnes of coal per year, accounting for four percent of the world coal market. 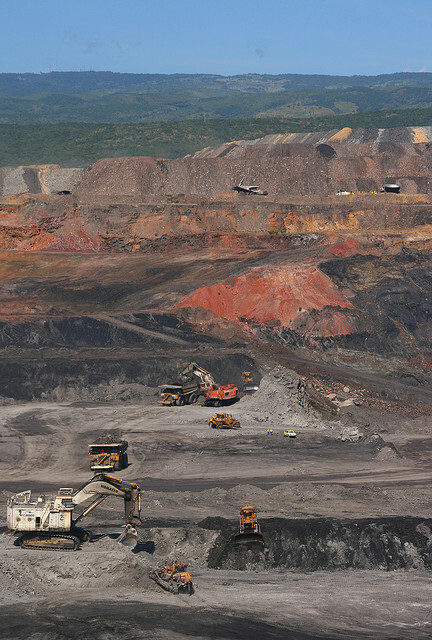 The company responsible for the Cerrejón coal mine is Bogota-based Cerrejón Coal Limited, a corporation jointly owned by BHP Billiton, Anglo American and Xstrata. Combined revenue for these three companies exceeded $40 billion in 2012. When I spoke to Romero in late October, indigenous communities affected by the Cerrejón mine were blockading the railway line that transports coal to port for exportation. The same railway line was bombed twice in October in attacks that military sources have blamed on FARC rebels. While the Wayúu and FARC are in no way connected, the latter attack highlights the economic importance of the coal project, which has made it an appealing target for paramilitary groups. The Cerrejón coal mine covers a vast tract of land and has been responsible for the displacement of whole Wayúu communities. The constitution recognises that the Wayúu are in danger physically and culturally of extinction, but Romero points out that more and more of their ancestral lands are being appropriated in the name of expanding the coal mining project. Romero believes that there has been some movement towards achieving these goals, but she says that the government will not enter into talks with indigenous leaders about hydrocarbon or mining projects. In contrast, the government of Colombia has entered into ongoing negotiations with FARC representatives in Havana, Cuba to talk about land reform and political participation, but Romero feels that “neither the government nor FARC represent us.” She fears that the voice of Colombia’s indigenous people are being left out of conversations of national importance. Around 80 percent of coal produced at the Cerrejón mine is exported to Europe and North America, including sales to municipal governments in the north-eastern United States. Romero points out that many of the countries that consume Colombian coal have signed international treaties to protect the rights of indigenous people. While Romero would welcome support from these nations, the Wayúu people will continue to fight for their rights as original people of Colombia. It seems that continued acts of resistance are their best hope for regaining sovereignty over their ancestral lands.